There are so many viable ways to retouch human skin in Photoshop and if you've found yourself here then you're probably looking at alternatives to the way you already do it. Maybe you're not happy with the results you're currently getting or maybe you're frustrated at other skin smoothing techniques that destroy or remove skin texture. It's useful at this stage to also point out that there is a lot of heated debates on what's an acceptable level to retouch skin too? What's the 'best' way to retouch skin? And of course whether or not we should be retouching skin at all. The point of this article is not to provide answers for those questions directly but to make everybody aware from the start that you as a photographer need to decide where you stand on this. The reason for this is that retouching (in my opinion) plays a fundamental role in our photography in the 21st century. Some great photographs can be ruined by inexperienced retouching but more importantly and perhaps more controversially, some terrible photographs can be made to look amazing after some very expert retouching. Are you creating a piece of art or a photographic portrait? As a photographer I think you need to decide whether you're going to create 'art' and if so are going to blur the skin to get a desired effect? You shouldn't have to defend yourself for that, it's art after all and you can do what you want. Alternatively, you can decide to make your work about the subject and make them look the best they possibly can do whilst still looking realistic and believable as a person. This means that when a viewer looks at your image they should say 'wow, what a brilliant portrait' and not 'wow, look at the retouching on that'. For me personally, I always try and push the retouching to the limit of what looks perfect without that getting in the way of the subject. Some may say I over-retouch my shots and that's fine but remember I've also been asked to retouch my work more by clients too. Everybody has different acceptance levels of what they believe is good retouching. One of the things that I look for when trying to maintain this 'human' look is skin texture and detail and I'm always looking to retouch the skin in a way that doesn't destroy or blur the texture on the skin. There are plenty of ways to blur the skin but in this particular retouching technique I'm going to be sharing how I retouch skin without loosing any skin detail whatsoever, and I'm going to be doing this through a technique called dodge and burn skin retouching. Click to enlarge. Dodge & Burn is often used to increase the contrast of a shot, in this technique we use dodge & burn to do the complete opposite. In the above image I have used the dodge & burn skin retouching technique to even out the skin tone and it is the most non-destructive form of skin retouching I'm aware of which ensures your skin texture is completely preserved. For those that don't know; 'dodging' in photographic terms means 'to lighten' and 'burning' means 'to darken'. We use this technique in the darkroom to add shadows and highlights on an image to increase the visual contrast of a shot. In this particular retouching technique though we're going to be using it in the opposite way. We're going to look at the darker points on the skin and 'dodge' (lighten) them and we're going to look at the brightest points on the skin and 'burn' (darken) them. This will even out the tone overall and visually reduce the appearance of bumps and skin issues. All 2D images, like photographs are visual representations of 3D objects. We show shape and form through light and shadow that gives the illusion of a 3D object on a screen or piece of paper. If we take that same principle down to the pore level, all lumps, bumps and pimples are simply a collection of highlights and shadows. If we can even those out and reduce the highlights and shadows on a pimple for example, it will start to visually blend back into the skin around it. Click to enlarge. Here's an simplistic representation of skin as seen in the form of highlights and shadows. See what happens when we darken the highlight side of the pimple and darken the shadow side of the pimple. They cancel each other out and blend back into the surrounding skin. In the above illustration I have drawn out how a pimple on a skin is actually visible to us in photograph. A pimple is simply a bump that has a highlight side and a shadow side. If we can add dodge and burn that pimple we can counteract that visual depth so that it disappears back into the skin. Take a look at the Pimple image above and then look at the Dodge & Burn diagram. See how they are opposite. I've painted white where there was shadow and black where there was highlight. When I combine the dodge and burn layer with the pimple layer in the technique I'm about to show you, it visually cancels out the pimple whilst having no negative effect on the the skin texture around it. Okay so now that I've finished waffling on about the theory, let's get stuck into the technique before we loose the millennials entirely. In the following dialogue box you want to select 'Soft Light' as you layer blend mode like we can see below. Once you've selected that, an additional option will become available that allows you to select 'Fill with Soft-Light-neatral colour (50% grey). Make sure that box is checked like you see below. Rename the layer if you like but once you hit ok nothing should visually change. In the layers panel though you should now have what appears to be a completely grey layer. These next couple of steps are going to help us see what needs to be adjusted in the image as we are about to add a couple of 'check-layers'. Check layers are essentially visual aids that we can delete once we're done with them but can really help us out before hand. In the following pop-up box just hit ok.
Next what we need to do is to double click on the layer icon so that an adjustment window opens up. In that window we need to reduce the saturation slider all the way to -100. Your image should now be look completely black and white. The reason for this is that it's far easier for us to dodge and burn when we aren't distracted by the colour in the shot. Once we're done dodging and burning we can delete this layer but for now its going to act as visual aid or a 'check-layer'. We're now going to add one more final check layer to help us and like before we will delete this later but for now it will increase the visual contrast of the shot which again will make our dodge and burning far easier. Then hit ok in the following dialogue window. Then all you need to do is change the blending mode of that curves layer to 'Multiply'. -Above the curves layer should be a drop down menu titled 'Normal', click that and in there you should see the blend mode 'Multiply'. At this stage you dont need to do anything else and you don't need to adjust that curve in any way whatsoever. The reason for that is because the multiply blend mode should have noticeably darkened down your image. This darker image will make it a lot easier for us to see any areas we need to work on and again, we're going to delete that curves layer later on too. Finally we're now ready to start dodging and burning but before we do we need to make sure we have our grey 'Dodge & Burn Skin' layer selected. Then select your brush tool (B) and then reset your palettes to white and black by hitting the (D) key. With your brush selected make sure you have the hardness set to zero and the brush size fairly small. You can adjust this by clicking on the little brush icon at the top of the screen. Now we can take a look at our shot and try to even out some of the bumps with out white and black paint. Start off with a very low opacity of around 5-10% and start to paint with white paint first onto the visually darker areas that you think might need lightening and evening out. Let's take a look at this area here for example. In the above shot you can see that there is an area that appears visually darker than the surrounding tones. If we paint with our white brush over it gradually we can start to bring that darker area back up to be a visually similar tone as the surrounding the skin. In the above shot you can see that the darker area has now been lightened which has given the skin a far smoother appearance. But remember, we've only lightened it so we haven't removed or destroyed any of that skin texture or detail. Take a look at that before and afters below with the check layers turned off. Now I appreciate this may not seem like much on its own but if we continue on with the rest of the image using that same principle, all these little adjustments and changes add up to make a big difference. 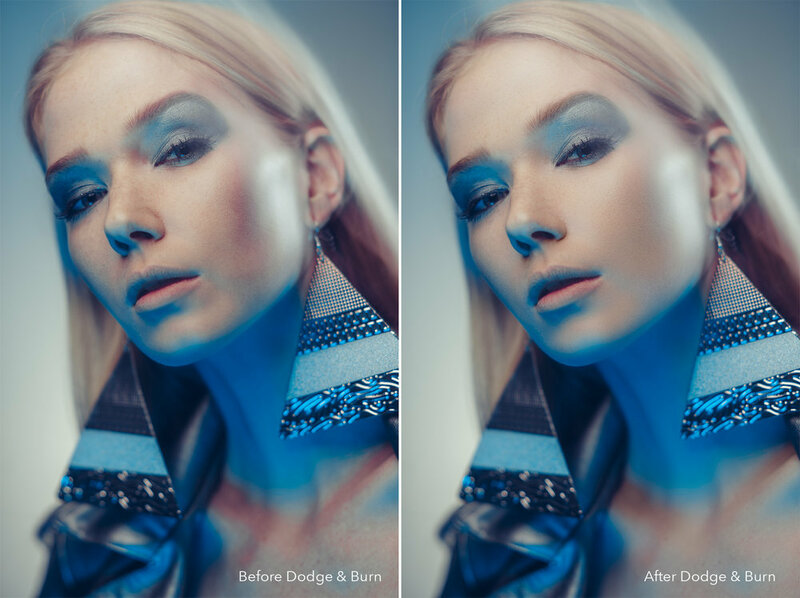 Take a look at the below before-and-after images to see what I mean and remember all that has been done to the image is this dodge and burn technique. Up until this point you've probably only used the white paint, but there will be times when you've either gone too far with the white, in which case you can add some black over the top of that to reduce the effect, or there may be areas that are too bright that you need to darken down a little. Simply switching to black paint and continuing on as you did before using the same visual principles to try and even out the tone of the skin. Once you're done and you're happy that you've evened out the skin tone, you can delete those check layers as there is no reason to keep them around any more. If you're interested to see what you've been painting on that grey layer up until this point, simply turn off the background layer beneath it. But be warned, it isn't pretty! Although this looks more than a little spooky, I think it does a great job of illustrating just how much you end up doing with simply white and black paint on a grey layer. Plus, and most importantly in my mind, this technique isn't destroying any skin texture whatsoever. So there you have it, the most non-destructive skin smoothing technique I'm aware of and I use this technique on all of my images and have done for many years. This dodging and burning technique is used by nearly every commercial retoucher in some form or another as it completely preserves the skin texture, something that a lot or most other techniques don't do. I think a lot of people might also be surprised to hear how few commercial retouchers choose not to use frequency separation for this reason as it can lead to destructive and sometimes arbitrary results. I for one don't use frequency separation for this reason and never have. This technique does take some practice to get good with and it's a little harder than a lot of other Photoshop techniques as it requires you to be able to see differences in skin tone, a skill that comes with practice and experience over time. Stick with it though and you'll be rewarded with stunning results in the end as that perfect looking fresh skin on models comes from maintaining maximum skin texture and there is no better technique for that than this one.